Don’t procrastinate—Start creating holiday email messages. The best time to start is now. For the US holiday season, GoDaddy recommends you start your holiday email marketing campaigns between November 1st and 15th. We all know that the holiday season is the busiest and most profitable for most companies. Shopping frenzies are starting earlier each year as brands are recognizing that on-line sales boosts saw a huge jump in 2017. Walmart estimates that online are soaring at 43% this quarter and over all will be up 40% for the year per this usatoday.com article READ HERE. Keep in mind your customers are just as busy as you are during this time of year and anything that can speed up their holiday shopping will benefit your subscribers & your business. Ideas on making your Email Marketing “Jingle” “Jingle”. 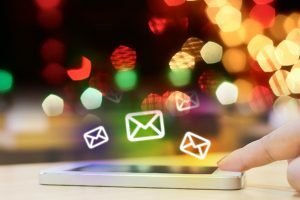 During this upcoming holiday season, businesses can find ways to grab the attention of their customers with different kinds of emails. This year’s holiday season is projected to bring in $123 billion in online sales, this would be a 15% + growth over last year. If you have an ongoing list of email subscribers, you should know that nearly all of them rely on their smartphones and tablets throughout most of the day.
. Offer with a call-to-action button that allows your contact to instantly buy what you are offering. 2. Promote “Exclusive” coupons that can be used online and/or in-store. 3. Stress Ongoing and upcoming holiday sales. 6. Drive in-store traffic with in-store only discounts. offer exclusive offers for those who are already customers. Use Clever Holiday Themed Subject Lines and Openings, Don’t Overdo it with Images and Text. Our “Inbox” of emails will usually all look the same during this hectic time of the year. Design your emails to draw attention with the use of flow, color, creative designs, or anything else to break from generic email design. Just as important, design for mobile-first. Last year 46% of all holiday website traffic was from smartphones. This is the new norm. Mobile shopping was a dominant trend in the 2017 holiday season. It was first noticed when Black Friday deals started on Thanksgiving, when almost half of all online retail traffic was coming from smartphones, according to Adobe Analytics data. That was an increase of more than 15% over last year. 1 out of 5 subscribers will buy something they see in your email promotion. In short, your sales won’t reach your projected sales if your campaigns aren’t mobile friendly and will decrease. With GreenMail Email Marketing, you don’t have to worry about your email being mobile friendly. Our drag and drop building blocks are mobile responsive and will automatically break down and view in smaller devices. You can also test the email design and look within our Inbox Preview Assistant tool. Smartphones were one of the biggest drivers of growth on Cyber Monday, responsible for 44.6% of site visits and nearly 30% of revenue, according to Adobe. Site traffic from phones increased 21% over last year, while revenue generated from phones increased 41% — a growth record. Within GreenMail, you can add a leaf, turkey, santa, snowman, stars, or a tree to your subject line for the holidays to grab attention. Research shows that brands who use emojis in their subject lines have seen a 45% increase in unique open rates. An emoji is a great eye-catching option to add to holiday flair and to be different from other email campaigns. Did you know that the snowman emoji drives the highest open rates? If you think about it, wouldn’t you pay more attention to an email subject line with a turkey, a Christmas tree, or a snowman? I would. Using urgency is a great way to boost sales with your holiday email marketing campaign. A time-limited holiday offer encourages visitors to take action now because nobody likes to miss out. This also encourages visitors to grab a huge discount before the sale ends. 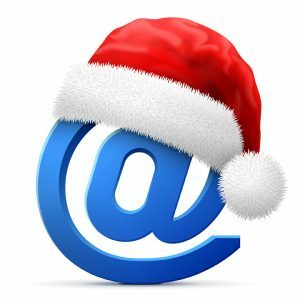 Happy holidays from your friends at GreenMail Email Marketing.